Alaskan born Daniel Brauchli (brow klee) is a musician and artist who has been playing, designing and building musical instruments for over thirty years. Now living in Tasmania, Daniel is making original designs of guitars, mandolins, etc, that combine the powerful acoustic properties of carbon fiber bracing, with beautiful Tasmanian timbers. These acoustic lap steel guitars combine the full tone range of a Weissenborn with the volume and power of a resonator guitar by using carbon fiber braces. All of my guitars use a "locked bridge" design, which reduces phase cancellation and increases the efficiency of the instrument. It also tends to increase the dynamic range like in an archtop or a classical guitar. They excel in situations where the player demands a lot from their instrument. My mandolins use carbon/wood braces with a molded curved top and double curved back. I am making a variety of instruments that cover influences from the renaissance to Latin America. The 10 string pictured was inspired by the Brazilian viola caipira. Other instruments on this page include a soft string bass, ukuleles, and various teardrop instruments designed for fluorocarbon strings. All of my instruments are fully hand made using a technique in which the sides are shaped to fit around the the top of the instrument. 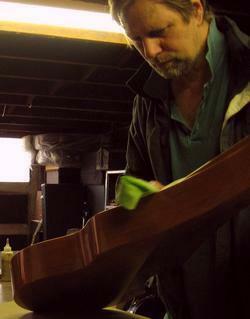 This removes the need for binding and allows more rounding of the edges to give the whole instrument a sculpted feel. Another feature of this method is the finished shape of the instrument is perfect because the sides follow the soundboard shape which is cut with a template and then folded out (bookmatched). Any slight distortions that appear on the photos are created by the lens angle. One of the best modern acoustic models is the speaker box. A sensitive ultralight speaker cone in a box made of heavy non-moving material is capable of producing almost any frequency at high volume. The acoustic concepts applied to speaker box design are just as relevant to musical instruments. Resonator guitars like Dobros are a good example of speaker box concepts used in a musical instrument. The highly efficient aluminium cone produces a lot of volume but has a limited frequency range, giving it a restricted nasal tone. A lightweight carbon reinforced wooden top is also highly efficient, but has a much wider range of tones than a metal cone. There are two ways of using carbon fiber in making musical instruments. One is to make the instrument completely from synthetics. The other way is to use it invisibly inside a wooden instrument to increase its strength, volume and tone. This latter concept is one that I have been working with since the mid '80s. Most luthiers who use carbon in wooden instruments (including myself) have been inspired by Australian luthiers Greg Smallman and Peter Biffin. Greg Smallman is probably the best known developer of carbon reinforced instruments. His classical guitars are considered by many to be the best ever made, and are used by many top players including John Williams. Here is a video of a Smallman guitar being played by Xuefei Yang. Note the power and sustain of the individual notes which is a hallmark of a good carbon reinforced instrument. I have a page devoted to guitar design and bracing. I am also posting photos of the construction process on facebook. There are many videos of my instruments on youtube. The name Weissenborn has been commonly used to describe Weissenborn copies and hollow neck slide guitars in general. This is because many well known players use original Weissenborn guitars or modern Weissenborn copies. Herman Weissenborn did not actually invent the hollow neck slide guitar. He was preceded by Chris Knutsen and probably others. My own slide guitars are an original design that was inspired by a number of instruments including Weissenborn. They are acoustically more related to Smallman, Klein, Dobro and Maccaferri. 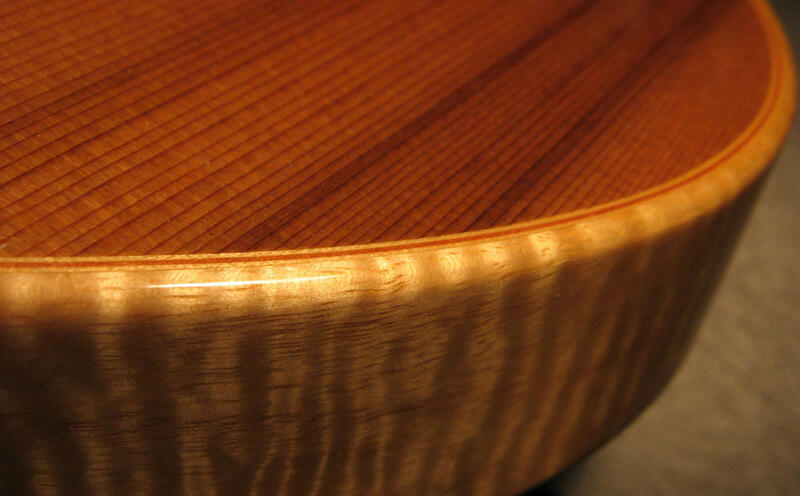 Blackwood Acacia melanoxylon: Tasmanian Blackwood is a close relative of Hawaiian Koa wood which has long been a favorite guitar timber, especially in Weissenborn and slide guitars. Many makers now prefer the slower growing Tasmanian Blackwood which has been more available. Tasmanian Eucalypts Eucalyptus regnans, E.obliqua, E.delegatensis: These three Tasmanian eucalypts are marketed as 'Tassie Oak'. The species E. regnans is the tallest flowering tree on the planet. King Billy Pine Athrotaxis selaginoides: This beautiful Tasmanian high altitude pine has become a favorite of some Australian violin makers for its sweet tone. Like many Tasmanian timbers, it is becoming very hard to obtain. Western Red Cedar thuja plicata: (USA/Canada) This wood has become popular in the last 30 years for flamenco and classical guitar sound boards. Its most remarkable trait however is its lack of expansion in humidity which makes it an excellent partner for carbon fiber. Carbon fiber: Carbon fibers are made repeatedly heating strands of a base material until it is almost pure bonded carbon molecules. When these strands (finer than human hair) are set in hard resin, the resulting structure has almost no expansion or contraction in the direction of the fiber. Using this in musical instrument bracing involves making beam or truss type structures of carbon, resin and wood which have high strength and little weight.